What will happen if I push myself to train as hard as possible to build muscles? How much is too much? How many days am I supposed to work out in a week? This article will help you understand more about the appropriate number of training sessions per week for each person. When it comes to eating, what is the right amount of food in each meal? How much is too much? Can I just eat until I am full? What is the answer to those questions? It depends on your body. It depends how many calories your body need to function properly each day. The same thing goes to your training. How many days you need to train each week depends on your body ability to recover. Your body’s ability to recover depends on how optimum your diet is and how long you rest. The process of build muscles is as simple as putting stress to your muscles by lifting weight and giving them sufficient rest time to recover. During a workout, muscle tissues are broken due to the amount of stress they get. With sufficient nutrients and rest, they adapt and grow bigger and stronger. 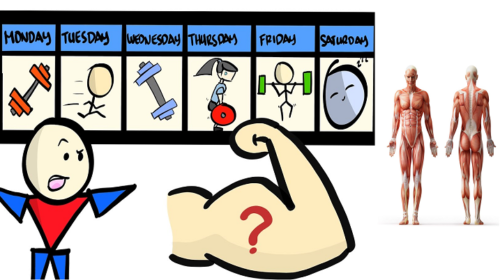 Back to the question, how many days do I need to train every week to build muscles? It depends on your body ability to recover, which depends on your training intensity, diet, and rest. Don’t rely on the theory that you should train two times a week, three times a week, and so on. Listen to your body. If you still have plenty of energy to train, then you can train as many days as you want every week. If you feel weak and get sick easily after training six days a week, then you may have exhausted yourself by training too many days per week. Exercise is supposed to improve our health. Because of the difference of slow-twitch and fast-twitch muscle fiber composition and other physiological differences, some people may recover sooner or later than others. Related article: Memories for your mass! Advanced trainees who train in higher intensity normally need more recovery time between training sessions. Some people are fine to train every day but most people prefer to work out on every other day to prevent boredom. If you don’t feel fit enough to train, skip the gym for one day and get some rest. However, this depends on the case. Most people feel that they feel refreshed with more energy and better concentration for work after working out. As a rule of thumb, working out less than three days a week doesn’t give maximum result in muscle gain. Doing all exercises on weekends is not enough if your goal is to build muscle, but it is still better than nothing.